The Interagency Autism Coordinating Committee (IACC) is announcing the addition of five new public members appointed by the Secretary of Health and Human Services, Kathleen Sebelius. The new members will bring additional points of view and expertise to the IACC, a federal advisory committee created to accelerate progress in autism spectrum disorder (ASD) research and services. The appointees represent several major ASD research and advocacy groups including Autism Speaks, the Simons Foundation, the Autistic Self-Advocacy Network (ASAN), the Southwest Autism Research & Resource Center (SARRC) and the University of California, Davis Medical Investigation of Neurological Disorders (MIND) Institute. "By adding new voices to the IACC and expanding the number of organizations represented on the committee, we hope to broaden our perspectives and increase coordination efforts," said Dr. Thomas Insel, IACC Chairman and director of the National Institute of Mental Health, part of the National Institutes of Health (NIH). Dr. Dawson is the Chief Science Officer for Autism Speaks, working with the scientific community and stakeholders to shape and expand the foundation's scientific vision. She also is a licensed clinical psychologist with a research focus on early detection and intervention, early patterns of brain dysfunction and the identification of biological markers for autism genetic studies. Dr. Dawson also serves as Research Professor of Psychiatry at the University of North Carolina at Chapel Hill, Adjunct Professor of Psychiatry at Columbia University and Professor Emeritus of Psychology at University of Washington. Dr. Fischbach is the Scientific Director for the Simons Foundation, where he oversees the Autism Research Initiative. He has spent his career as a neuroscientist studying the formation and maintenance of synapses, the junctions between nerve cells which allow signals to be transmitted. Before joining the Simons Foundation, Dr. Fischbach served as the Director of the National Institute of Neurological Disorders and Stroke (NINDS) from 1998 to 2001 and as the Executive Vice President of Columbia University Medical Center and Dean of the faculties of medicine from 2001 to 2006. Mr. Ari Ne'eman is the Founding President of the Autistic Self Advocacy Network, where he works to increase the representation of autistic people in public policy discussions. He is an adult on the autism spectrum and a leading advocate in the neurodiversity movement. Mr. Ne'eman has served on the New Jersey Adults with Autism Task Force and the New Jersey Special Education Review Commission, where he authored a minority report advocating legislative action against the use of aversives, restraint and seclusion. He is a board member of TASH, an advocacy group for people with disabilities, and is involved with the Maryland Coalition for Inclusive Education. Denise Resnik is the co-founder and Board Development Chair of the Southwest Autism Research & Resource Center (SARRC). She is the mother of an 18-year-old son with autism. Ms. Resnik serves on the Autism Speaks Family Services Committee and Advancing Futures for Adults with Autism (AFAA) Steering Committee. She participated in the 2006 NIMH Autism Matrix Review and the IACC Scientific Workshops to develop the IACC Strategic Plan and subsequent updates. Dr. Marjorie Solomon is an Assistant Professor of Clinical Psychiatry in the Department of Psychiatry and Behavioral Sciences at the University of California, Davis. She serves on the faculty of the Medical Investigation of Neurological Disorders (MIND) Institute and the Autism Research Training Program, where she conducts research on a social skills training intervention for high-functioning children with ASD, incorporating parents and siblings in the research. In addition to her clinical research work, Dr. Solomon studies cognition and learning in high-functioning individuals with ASD. The mother of an 8-year-old boy with autism is suing Indianapolis Public Schools after she said her son was tied to a chair by a teacher's aide. Jennifer Robbins said she went to William Penn Elementary School on Jan. 14 for a conference and found her son, Hudson, belted to a chair in the corner of his classroom, 6News' Joanna Massee reported. "It was wrapped around and tied twice in a double knot," said Robbins, who described the mostly non-verbal boy as looking disheveled and as if he had been crying. Health and pharmaceutical executives are throwing thousands of dollars to the Republicans challenging Indiana Rep. Dan Burton in next week's House primary, deepening the longtime industry critic's woes as he battles to capture his party's nomination. Burton, a 14-term incumbent, has antagonized health care and drug companies by advocating for alternative medicine and insisting that there is a connection between vaccines and childhood autism. And as Burton fights challenges from two credible Republicans, state Rep. Mike Murphy and former Indiana Republican Party executive director Luke Messer, executives are coming to his opponents' aid. Executives at the pharmaceutical giant Eli Lilly, a major employer based in Burton's district and stung by his vaccine allegations, have anted up more than $3,000 for the congressman's opponents this cycle, including a late $500 contribution to Messer from the company's chairman emeritus, Sidney Taurel. Burton also supported reimportation of drugs from Canada and opposed the final version of the Medicare prescription drug bill. Dan Burton has made his reputation over nearly three decades in Congress as a fierce partisan who led Republican investigations of the Clinton administration and has taken on lonely causes such as the disputed link between mercury in vaccines and autism. But he's getting little respect from a crowd of primary challengers who say he's a Washington gadfly and mock him as a useless appendix. To them, and some voters, Burton's time has come — and gone. "He's a fine man, but he's been there too long," said Jim Peacock, 68, of Carmel who is a partner in a casket making company. "We need fresh bodies, fresh thinking and not tenured politicians." Burton, 71, faces six challengers in Indiana's May 4 primary, an unprecedented test for the congressman who's been in Washington since 1982. Republicans looking ahead to November expect to keep the seat, long considered one of the nation's safest for the GOP. But whether Burton is in it for a 15th term could depend on voter fatigue with longtime politicians and whether the crowded primary field dilutes the anti-Burton vote in the district that covers suburban Indianapolis and stretches north to several rural counties around Kokomo and Marion. Advocates for children with autism say that a bill signed into law Friday by Gov. Brad Henry is a good first step toward parity in health coverage for the disorder. The legislation, added to Senate Bill 2045, requires health insurers to cover the same illnesses for autistic children as they do for children without the condition. The law came about after parents reported that medical coverage was denied for services having nothing to do with autism, such as playground injuries. "This is a bill to stop any restrictions or discrimination against individuals with autism from medical or surgical procedures that are currently covered," said Wayne Rohde, whose 12-year-old son Nick was diagnosed with severe regressive autism when he was 4. "The insurance companies needed to stop this discrimination. The leadership of both parties decided it wasn't right." Rohde said insurance companies were limiting coverage for occupational and speech therapy for autistic children but not imposing those limitations for children without autism seeking the same treatment. We used data sets from Denmark, California, Japan, and a worldwide composite of studies. In the Danish, California, and worldwide data sets, we found that an increase in AD cumulative incidence began about 1988-1989. The Japanese study (1988-1996) had AD cumulative incidence increasing continuously, and no changepoint year could be calculated. Although the debate about the nature of increasing autism continues, the potential for this increase to be real and involve exogenous environmental stressors exists. The timing of an increase in autism incidence may help in screening for potential candidate environmental stressors. Subsequent studies on MMR vaccine and thimerosal-containing vaccines did not support a relationship with autism. In a 2004 report, the Immunization Safety Committee of the Institute of Medicine determined that the body of epidemiological evidence favors rejection of a causal relationship between either MMR or thimerosal containing vaccines and autism. Work on tetrachlorethylene, trichloroethylene, and trihalomethanes in drinking water also has not supported a relationship with autism. Certain airborne metals and solvents still require confirmation of any relationship to autism. New research studies are continuing to evaluate other possible environmental factors. In The Vaccine War, airing Tuesday, April 27, 2010, at 9 P.M. ET on PBS (check local listings), FRONTLINE lays bare the science of vaccine safety and examines the increasingly bitter debate between the public health establishment and a formidable populist coalition of parents, celebrities, politicians and activists who are armed with the latest social media tools, including Facebook, YouTube and Twitter, and are determined to resist pressure from the medical and public health establishments to vaccinate, despite established scientific consensus about vaccine safety. “Scientifically, I think the matter is settled,” says Anders Hviid, an epidemiologist at the Statens Serum Institut in Denmark. In one of the largest and most comprehensive epidemiological studies available, Hviid and colleagues analyzed data on more than a half million children and found no link between the MMR “triple shot” for measles, mumps and rubella and an increased rate of autism—a link that’s been strongly asserted for years by anti-vaccine activists. Similar epidemiological studies in Denmark also failed to reveal a link between the mercury preservative thimerosal and autism. In fact, around the world, peer-reviewed epidemiological studies have found no link between autism and either the MMR shot or thimerosal. It is tough enough to contend with mediation and due process. Just imagine finding out that your lawyer is not what he seems. As the Washington Post reports, that's what happened to some DC area special-ed parents. Into this close-knit world entered Howard D. Deiner, 53. He worked his way into the inner circle by listing himself as a lawyer on a number of Web sites that cater to special education parents, operating in the legal niche for families wanting to challenge the way public schools educate -- or fail to educate -- their children. But Deiner wasn't licensed as a lawyer for much of the time he took those cases, according to court records, and to bypass that issue he allegedly once signed another lawyer's name on important documents. He lost several cases at a point in the special education process that is the bleakest and the most critical for parents. Some associations wouldn't delete Deiner's name from their listings until Pete Wright, a nationally known special education consultant and lawyer who created the "Wrightslaw" Web site, http://www.wrightslaw.com, pressured them to do so after confronting Deiner. "That someone would falsely hold themselves out as a lawyer to parents of children with a disability, that is about as bad as it gets," Wright said. "To put this on these parents, how self-centered can somebody be?" Deiner remains listed on at least two Web sites for families with autism as a lawyer who might be consulted for help with school problems. In The San Francisco Chronicle, Liza Gross and Sharon R. Kaufman explain why appeals to authority are not dispelling fears of vaccines. A Missouri Senate committee on Tuesday split the difference between House and Senate versions of legislation mandating insurance coverage for children with autism. The new compromise requires state-regulated health insurers -- about 40 percent of the market -- to cover autism spectrum disorders, including providing expensive behavioral treatment. It caps annual spending on that treatment at $45,000, midway between the $36,000 and $55,000 caps found in versions of the measure passed by the House and Senate, respectively. It also provides coverage through age 18. The committee unanimously approved the bill, moving it to the Senate floor for debate. Oklahoma Gov. Brad Henry's desk is the next stop for legislation requiring health insurers to cover the same illnesses for autistic children as they do children without the condition. Sen. Jay Paul Gumm of Durant said Tuesday the measure was passed by the House and Senate and now goes to the governor to be signed into law. Gumm says families have told him some insurers deny claims for autistic children for illnesses unrelated to the diagnosis. Oklahoma does not require health insurers to cover autism and most insurers exclude it. Gumm says families with autistic children pay premiums to health insurers and expect to be treated fairly. He says that if an autistic child breaks an arm, they should be covered like anybody else. Gov. Mark Parkinson signed a bill Monday that recognizes the needs of kansas children and their families. House Bill 2160 requires the Kansas State Employees Health Care Commission to cover services for the diagnosis and treatment of autism spectrum disorder in any covered individual under 19 years old. The bill stipulates that coverage must be provided in a manner determined between the autism services provider and the patient. Coverage will also be subject to the same annual deductibles and coinsurance provisions as established for other physical illness benefits. In Georgia last year, Senate President Pro Tem Tommie Williams (R-Lyons) pushed for legislation called “Ava’s Law,” named for his grandniece, who was diagnosed with ASD. The bill, opposed by insurers and the Georgia Chamber of Commerce, would require private insurers to cover medically necessary autism treatments and services. But lawmakers shelved it in a study committee. The bill emerged in the current session. But a version that was approved in the Senate removed the mandate. Instead, it creates a task force by July 31 that would develop a plan for educating health professionals and parents about services, early intervention and funding, as well proposing public policy. This new version heads to the House in the few remaining days of the session. The Georgia Chamber said its opposition is based on objection to all mandates that increase costs for business-sponsored employee health benefits. “It is a very difficult issue and is not made easily on just the economics,” said John Kruecer, the chamber’s senior vice president of public policy. He said the chamber has met with autism advocacy groups in recent months but was unable to reach a compromise. Autism Speaks, a national group advocating insurance changes, said its analysis shows the Georgia legislation would add only $21.20 per policyholder or about 0.63 percent. In 2009, the Council for Affordable Health Insurance, an association of insurance carriers, estimated an autism coverage mandate increases the cost of health insurance by about 1 percent. With the number of autism cases growing, the council predicts the cost will move into the 1 percent to 3 percent range. “If legislators want to help these families, they should create programs specifically targeted to meet their needs and properly fund them from general revenues ... rather than try to force the costs onto health insurance, which will just increase everyone’s premiums,” the council wrote in a position paper. Blue Cross Blue Shield of Michigan may have finally settled a historic autism lawsuit for $1 million this week, but it still has a big plaintiff on its back: a judge. On Tuesday, a Detroit federal judge gave final approval to the insurance company's $1 million settlement with more than 100 families seeking coverage for autism treatments. A separate, similar suit remains pending against the insurance giant -- this one brought by Oakland County Circuit Court Judge Cheryl Matthews. Matthews, who has a son with autism spectrum disorder, filed her suit against Blue Cross last July in Michigan state court, about one month after the insurance company initially announced its settlement in the Johns v. Blue Cross class action. Under Tuesday’s settlement, Blue Cross agreed to cover what is known as applied behavioral therapy (ABA) treatments, but only for patients who had received the treatments at Beaumont Hospital in Royal Oak, Mich. Matthews' son received his ABA treatments at another facility in Southfield, Mich., and Blue Cross, her lawsuit contends, has wrongfully refused to cover them. Shawn Donahue, who represents Blue Cross & Blue Shield of R.I., had just emerged from a hearing room in the State House, where he and other health insurance lobbyists had expressed skepticism about a bill that would require them to cover the diagnosis and treatment of autism. The lobbyists had signed up to speak against the bill, but once they took a seat before the microphones, they shied away from spelling out their objections head-on. Donahue suggested that the bill might lead to duplication of effort, in that insurers already pay assessments — about $5 million annually in the case of Blue Cross — to support early intervention services for very young children. Outside the hearing room, Janes, the vice president and controller of Washington Trust Co., stepped up to Donahue and invited him to visit the treatment program of her daughter, Amelia. Janes, a Blue Cross subscriber, assured Donahue that her health insurance does not pay for the intensive, highly specialized treatment called Applied Behavior Analysis. At one point, 40 hours a week of ABA for Amelia cost Janes $30,000 a year out of pocket, she told Donahue. A one-year-old nonprofit is serving as a matchmaker between an abundant supply of soon to be laid-off teachers and a critical shortage of special ed instructors. As a result, at least several thousand vacant special ed positions likely will be filled this fall by teachers who would otherwise be looking at unemployment or substitute teaching. The California Teacher Corps announced this week that it is expediting efforts at retraining teachers who are interested in becoming certified to teach special education. The Corps represents alternative certification programs, which are particularly suited for individuals seeking second careers as teachers and, in this case, for teachers interested in changing their specialty. A campaign to train within the next year 25,000 veteran special education teachers for the rigors of dealing with autistic students was announced last week. The California Teacher Corps, a leader in providing alternative certification programs, announced the effort that will be taken up in partnership with local school districts and county offices of education. The initiative comes in the wake of new autism authorizations approved last year by the California Commission on Teacher Credentialing aimed at expanding the number of teachers available to deal with the crisis surrounding autistic students. Autism has gained a great deal of attention from policymakers and journalists. But there has been little scholarly research into autism policy and politics. This paper sketches what we know about the topic and raises questions for future research. It follows the stages of the policy process. Initiation is the first stage. Psychologists have known of autism since the 1940s, but why has it has become a major national issue only in the past decade? Estimation is the second stage. One possible reason for increased attention is the sharp rise in the reported prevalence of autism. But such data raise another question: how much of the increase reflects changing diagnostic criteria and how much is “real”? Mobilization is the third stage. Emerging issues attract the attention of existing groups or spawn the formation of new ones. In the case of autism, why do these groups form? How and why do they clash or cooperate? Selection and implementation are the fourth and fifth stages. The policy response involves education, health care, and disability policy at the national, state, and local levels. To what extent do policymakers in these fields work together -- or do they work at cross-purposes? What interest group pressures affect policymaking? In the evaluation stage, policymakers reckon how well a policy is working. 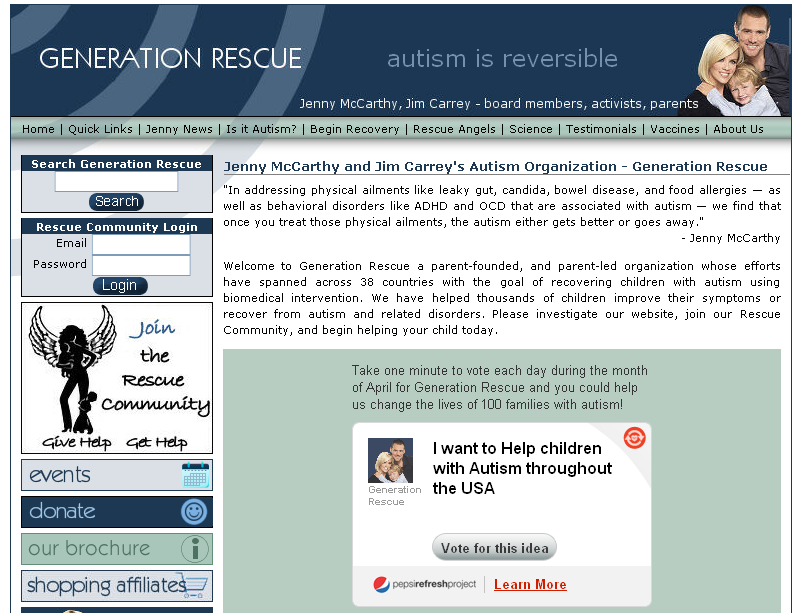 Are they tracking how much help is reaching people with autism? And is this assistance producing good long-term outcomes? A 2009 analysis by the Autism and Developmental Disabilities Monitoring Network revealed that 1 in 70 boys and 1 in 310 girls nationally has autism. The numbers are even higher for Georgia, where one in 98 children has autism, said Dr. Amy Pakula, clinical director of diagnostic and evaluation services at the Marcus Autism Center in Atlanta. For boys, the number is one in 60; one in 294 for girls; and one in 83 white children compared to one in 105 African-Americans. “I’m hard-pressed to think of another condition that has that same prevalence,” she said. This fall, in fact, California voters will vote on a ballot measure to legalize marijuana. The initiative would forbid adults from selling or giving marijuana to minors, but history of tobacco and alcohol regulation would suggest that youngsters would have little difficulty getting it. April is Autism Awareness Month, a good time to make ourselves a bit more conscious about this disease and what we can do..As I have traveled throughout Iowa, I have met many families affected by autism and know that they worry about the challenges ahead for their child with a significant disability. But this does not mean that their lives will be unfulfilled. It is for this reason that funding for autism research, awareness and advocacy is so crucial. And that is why I worked as Chairman of the subcommittee that funds discretionary health programs to secure full funding for the Combating Autism Act every year since the bill was signed in 2006, a 33 percent increase in that time. Harkin is sponsor of S. 1652, the IDEA Full Funding Act. Although Harkin chairs the HELP committee, which has jurisdiction over the bill, it has not yet advanced. Insurance agency representatives asked a Missouri House committee Tuesday to reject the Senate version of autism insurance legislation. The House and the Senate have passed separate bills mandating insurance coverage for applied behavioral analysis therapy to treat autism spectrum disorders. A cost difference divides the two bills, with the House setting a $36,000 annual cap for treatment while the Senate bill would cap treatment at $55,000. The two bills also differ on an age limit for coverage, with the House bill requiring coverage until age 18 and the Senate until 21. Additionally, the House bill establishes license requirements for autism therapists while the Senate version does not. The Senate bill is SB 618. They're grateful for the time they spent together and only wish the best for each other. But for Jim Carrey and Jenny McCarthy, it's over. "Jim and Jenny have recently decided to end their five-year relationship," Carrey's rep Marleah Leslie tells PEOPLE. The breakup presents a problem for Generation Rescue, which prominently features the couple on its website. 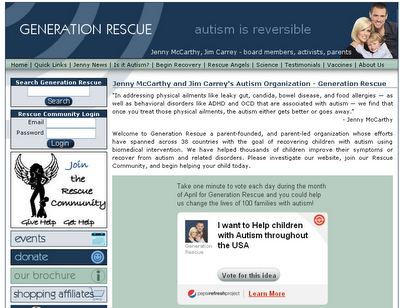 Indeed, the front page calls it "Jenny McCarthy and Jim Carrey's autism organization." The New York Times reports on a plea for common ground, which originally appeared in The Huffington Post. I've experienced this war in the autism community firsthand. I recently published an essay called "Cure du Jour", expressing my frustration with snake oil salesmen who prey on the desperation of parents with unfounded promises. People who disagreed with what I wrote vilified me in the autism blogosphere, calling me a selfish, bitter and bad mother. But the next day I received a heartening email from Paul Offit, M.D., author of Autism's False Prophets: Bad Science, Risky Medicine and the Search for a Cure, who said, " A brave, clear, forthright opinion. For which, no doubt, you will be hammered by those who hold a different opinion and, instead of engaging in honest debate, make things personal and mean. Hang in there... Sometimes doing the right thing isn't the easy thing." This is a man who knows a thing or two about "personal and mean"; since the publication of his book, he has received death threats. So on the eve of World Autism Awareness Day, where do we go from here? Where is our community's common ground? The Star-Tribune reports on stalled autism insurance legislation in Virginia. Limited legislation passed the Senate but a House committee tabled it. Autism insurance advocates are frustrated that the General Assembly has rejected both comprehensive coverage and more-limited coverage. "I don't know what we can do about that other than shine the light of day on it and say, 'We've done everything we possibly can to accommodate your concerns about this bill,'" Champion said. "The question is, What bill would they pass?" According to Autism Speaks, autism affects more than 1.5 million Americans, including 75,000 Virginians. The group's Web site said that last week, Iowa, Kansas and Kentucky all passed autism insurance reform bills. As a result, 18 states now require health insurance companies to provide coverage for autism treatment. On Easter Monday, it is useful to remember that the largest nonprofit provider of autism services is ... Easter Seals. The organization lists a variety of legislative initiatives it has supported, including the Education for All Handicapped Children Act of 1975, the forerunner of IDEA. The Kentucky Senate has given final passage to a bill that would require private insurance companies to cover services for autistic children. The Senate voted 37-0 Thursday to send the bill to Gov. Steve Beshear. Under the bill, large group plans would be required to pay up to $50,000 a year for autism therapy and other treatment for children younger than 7. Those plans would cover $1,000 a month in treatment for youths ages 7 to 21. The bill would require smaller plans, with 50 or fewer employees, or individual plans to provide $1,000 per month in autism services. Republican Sen. Tom Buford of Nicholasville said the bill will help ensure that autistic children reach their full potential. The special needs therapist accused of swindling the city and parents of autistic children out of thousands of dollars has sparked new legislation that aims to prevent unqualified persons from providing behavioral therapy to special needs children. Drafted with input from Attorney General Richard Blumenthal and Suzanne Letso, CEO of the Connecticut Center for Child Development, the bill will ensure that only licensed professionals provide individualized education for autistic children. The bill, named "An Act Concerning Special Education" requires that behavioral analysts that provide autistic children individualized education hold a bachelor's degree in a related field and is licensed by the Department of Health or certified by the State Department of Education.